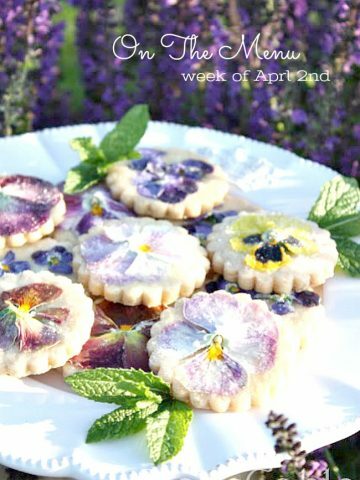 After you check out this yummy recipe, go see all the other wonderful “foodie friday” recipies at Designs by Gollum! 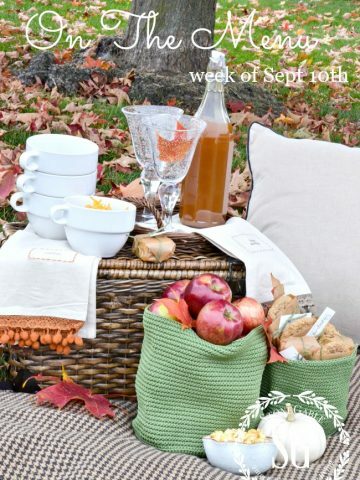 This recipe just screams “FALL”!!!! I made this for my boy’s birthday meal (see blog 10-7) and everyone gave it 2 enthusiastic thumbs up. I adapted this recipe from one made by Robin Miller, food network. But I can’t leave a recipe alone- so I made it my own. This recipe is worth the effort and has that WOW factor. I doubled this recipe to feed 10 with leftovers. Preheat oven to 450 degrees. Coat roasting pan with cooking spray.Cook bacon in pan until crisp. Remove from pan and let cool, crumble, set aside. 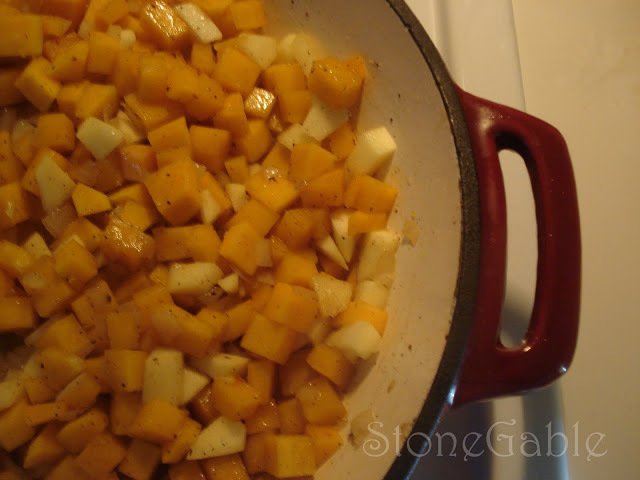 In pan with bacon fat, add squash, onions and apple and cook 5-7 minutes, over med heat until onions are soft. 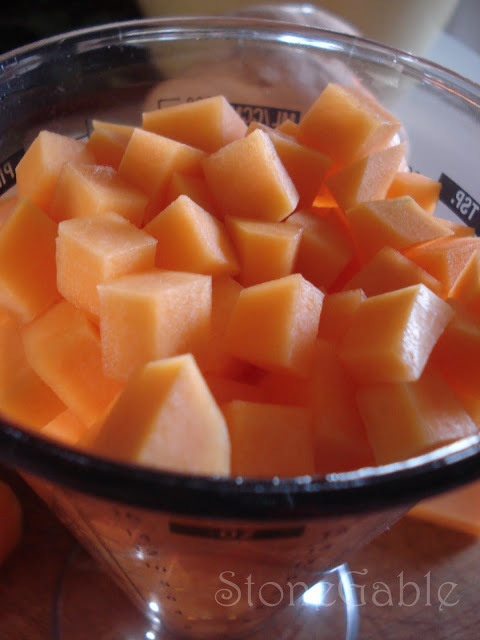 Remove from heat and transfer to large bowl. 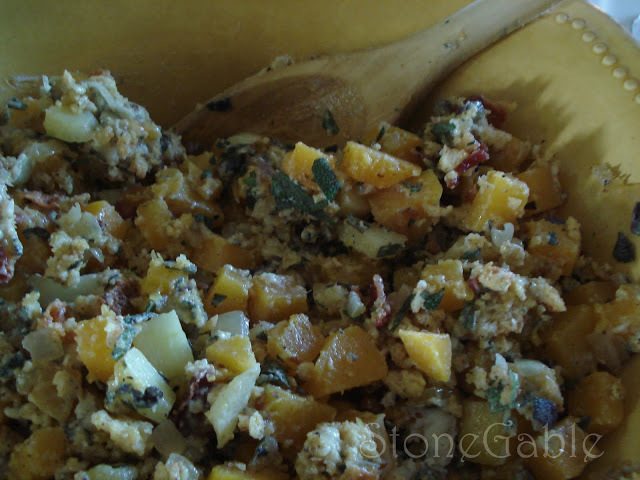 Add crumbled bacon, cornbread, bleu cheese, 2TBS sage leaves, ¼ cup chicken stock and salt and pepper. Mix gently. 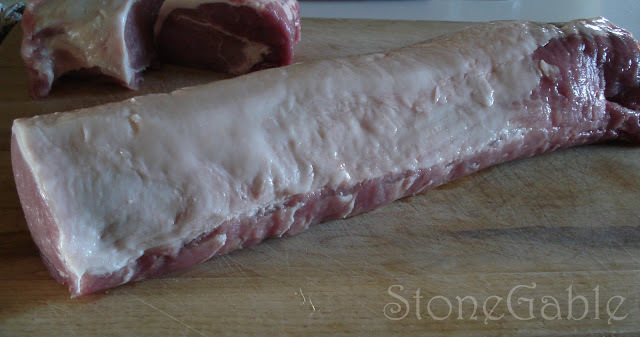 Butterfly pork loin. 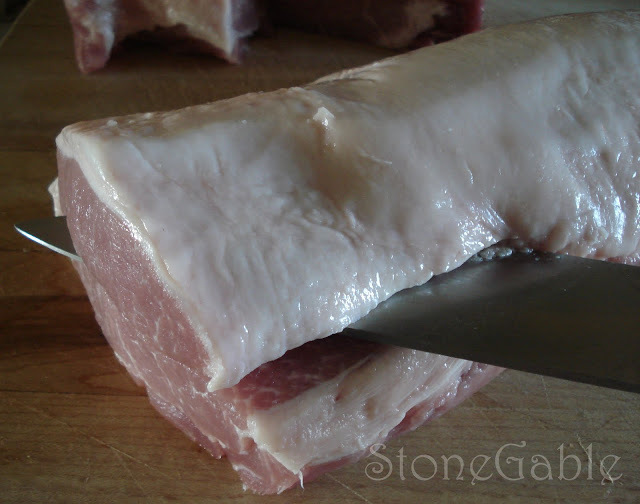 Using a long, sharp knife make a lengthwise cut into the top 1/3 of the pork loin and cut through the pork loin until you are close (1 inch) to the opposite lengthwise edge. 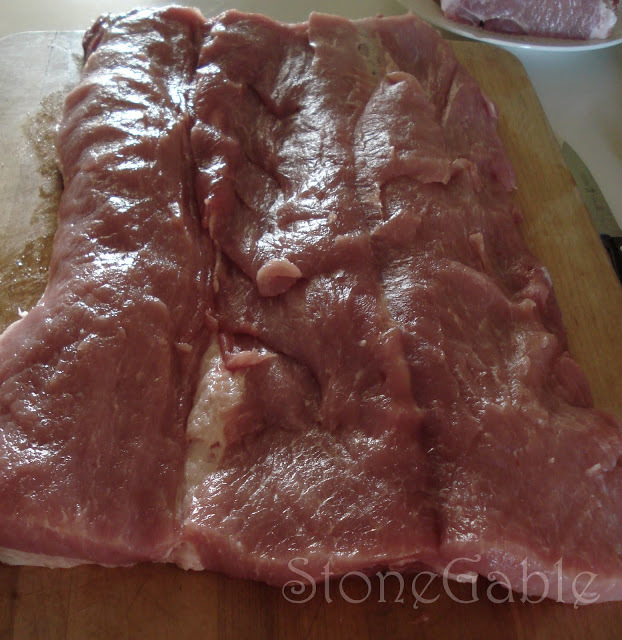 Cut into the 2/3 thickness of the pork loin-starting at the thick part at the fold line. 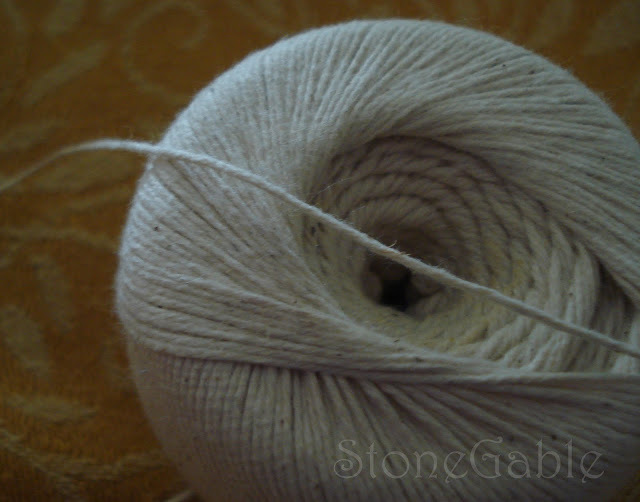 Cut the 2/3 thickness in half lengthwise until you are close (1 inch) to the opposite lengthwise edge. 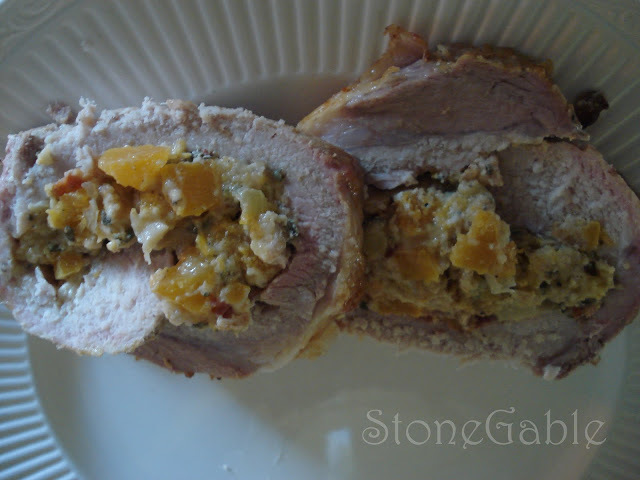 Open the pork loin up. It will be 3 x’s as wide but 3 x’s thinner. 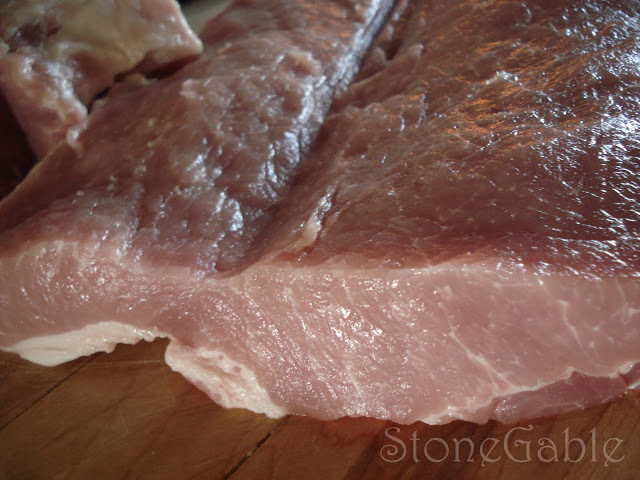 *VERY IMPORTANT– YOU CAN ASK YOUR BUTCHER TO BUTTERFLY YOUR PORK LOIN. I got mine at Costco and they would not butterfly it. The internet has great sites with videos showing you how to butterfly. Not a pretty job, but good enough! 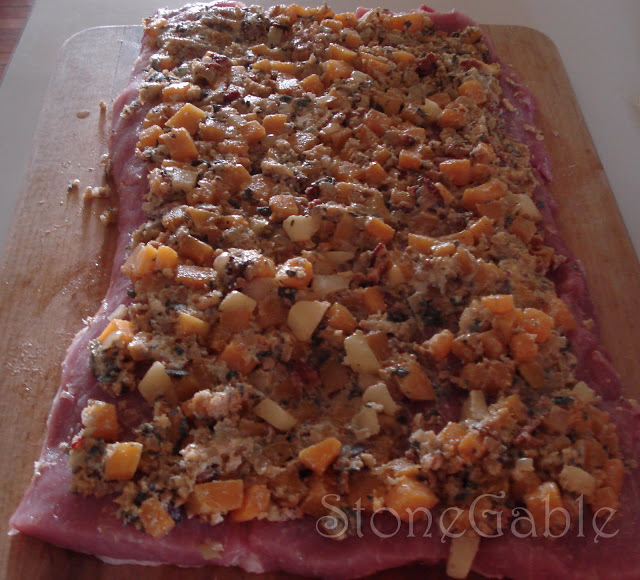 Spread butternut squash mixture over meat. 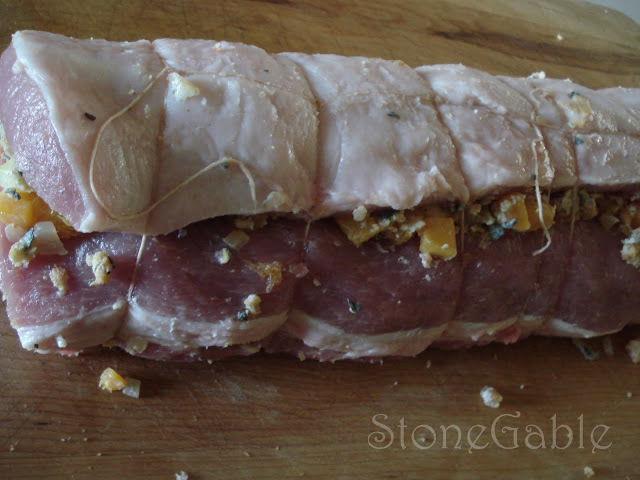 Roll up pork from lengthwise end and tie with kitchen twine, approx. every 2-3 inches. Roast in pan at 450 for about 15 min. Reduce heat to 325 and roast for 45 more minutes, until meat thermometer reads 160 degrees for medium-well. Remove from oven and let rest for 10 minutes. 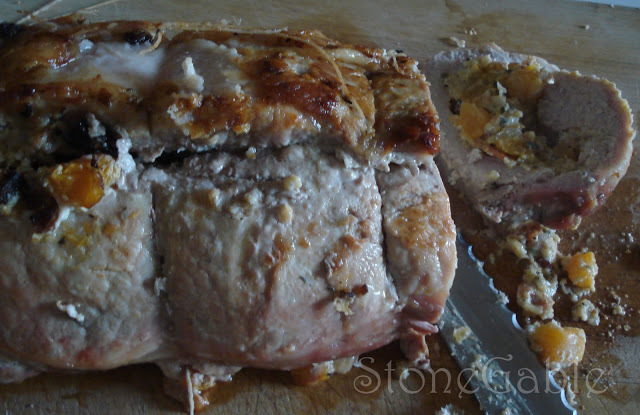 Cut into 1-2 inch thick slices (I like thicker slices for this roast). In a small sauce pan whisk together chicken stock, corn starch, dry sherry. Bring to a simmer and let thicken. 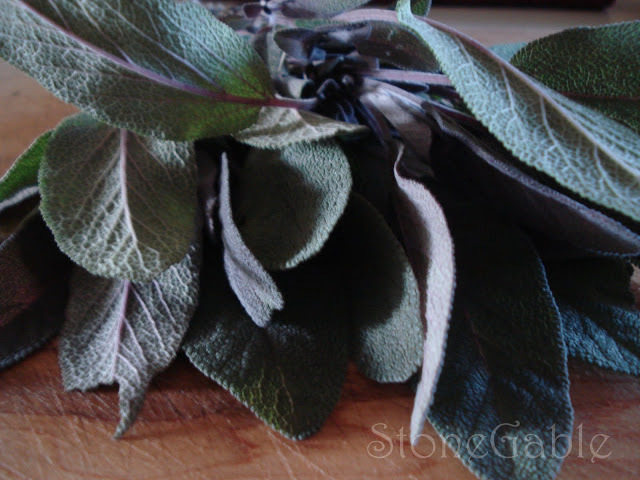 Add sage leaves and simmer for 1 minute. I added pan drippings from the Pork Loin and simmered an additional couple minutes.Serve spooned over meat. This looks absolutely positvely fabulous. I can’t wait to try it. Yvonne…such DELICIOUS looking food and served on that tablescape, a meal to remember! Your family must feel very special to have you do such wonderful things for them. What a wonderful post! Your roast and that delicious filling look scrumptious. Thanks for all the work it took to put this post together. Have a great day. Not only does this look delicious, it makes a beautiful presentation. I’m amazed you could roll it with all that stuffing. Your entire menu sounds divine. 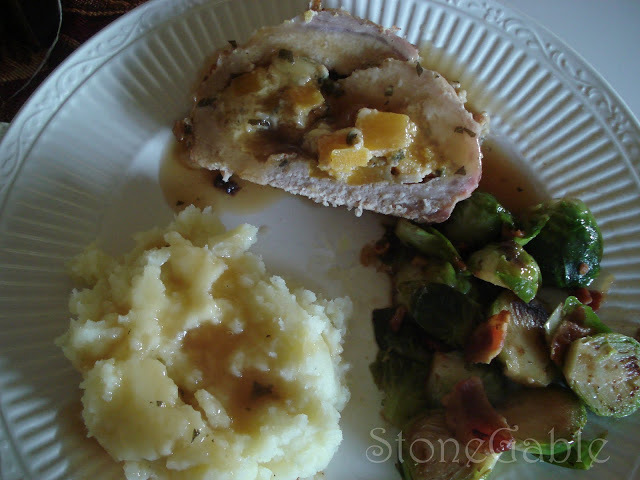 Three of my favorite things-pork, squash and sage. I may have to make this very recipe Sunday for my family. Thanks for this recipe! Oh Yvonne. The roast looks divine. The brussell sprouts make me crazy. 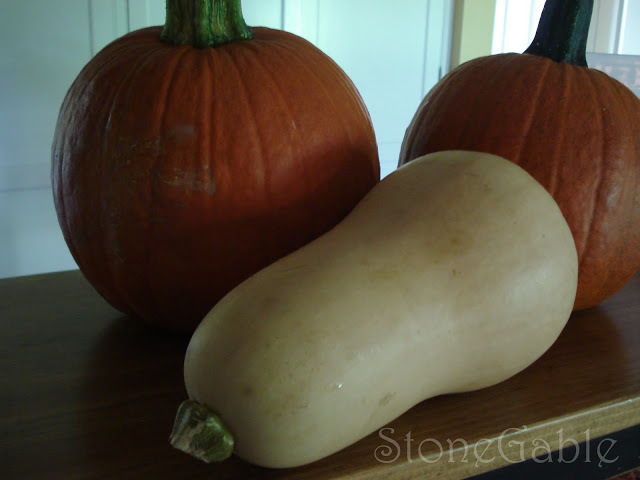 Ours are no good this year and I didn’t buy any for our Canadian Thanksgiving this weekend. Now I want them more than ever. You are a woman after my own heart! 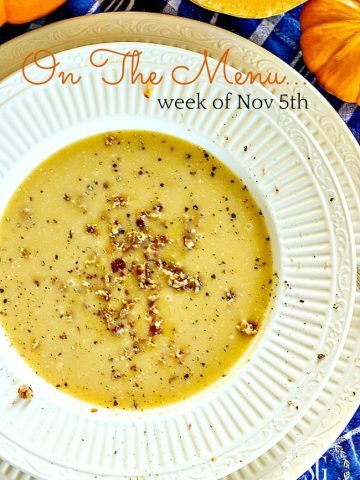 Love the menu and the recipe! I’m going to have to make this – it sounds wonderful! Thanks so much for sharing!